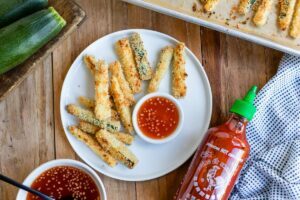 When it comes to making crispy zucchini fries, I’ve learned that it’s best to go with the classic formula: dredge, dip, and coat. I’ve tried skipping the dredging part and I’ve even seen recipe that combine steps 1 and 3. But it never quite works out. Is it a pain to do each step? Does it create a lot of mess and a lot of dishes to wash? But it works. 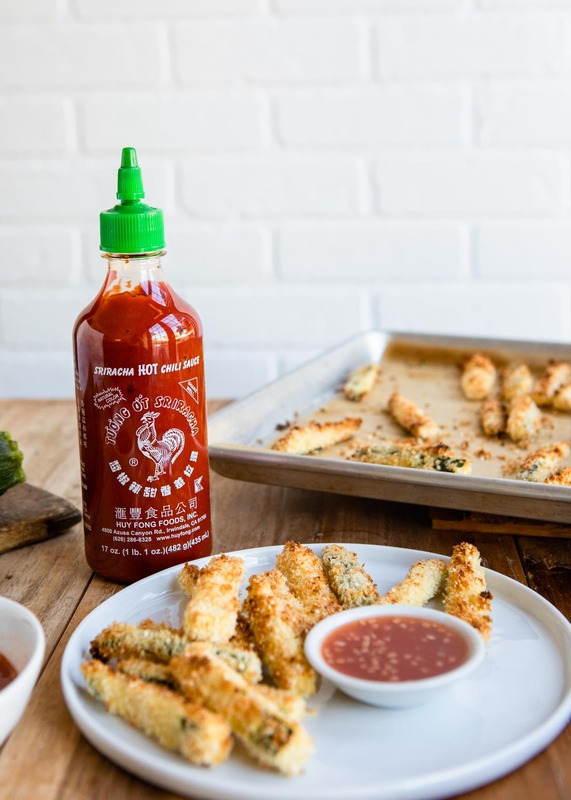 Dredging your zucchini fries in flour gives them a barrier to keep the moisture from the zucchini from seeping into the breading. And the dipping step–usually a mixture of beaten eggs and milk–adheres the coating. In this recipe, that would be a combination of panko for crunch and sesame seeds and garlic powder for flavor. To make sure everything is browned nicely and super crispy, spray the zucchini with oil before baking. 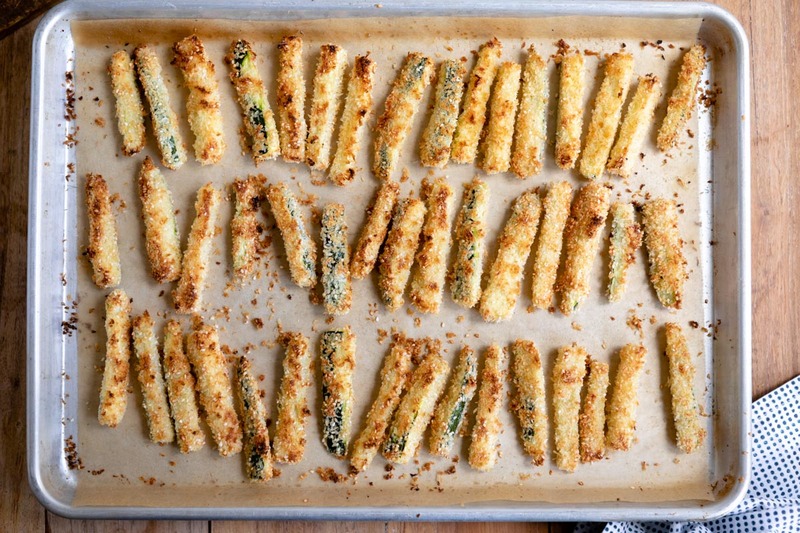 Some people also take the extra step of baking zucchini fries on a rack so air can circulate better and the bottoms don’t get soggy–I don’t have oven-safe racks, so instead of doing that, I’ve found flipping the fries halfway through baking time does the trick. 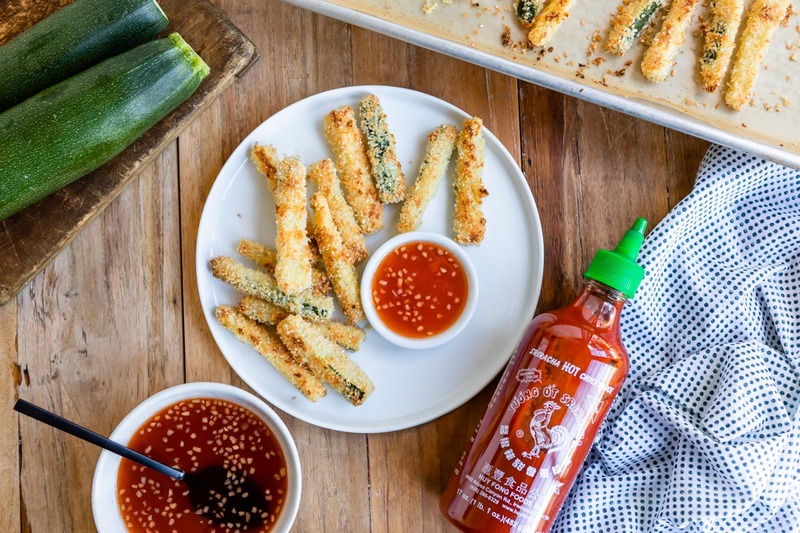 Of course, you can’t serve crispy zucchini fries without a good dipping sauce. And this one is my favorite! It’s a homemade sweet chili sauce that’s sweetened with honey instead of sugar or corn syrup. If you happen to have any left over, it’s also good for drizzling over tofu or steamed broccoli. The perfect side for a burger, these fries are crispy right out of the oven. Place 3 shallow bowls or plates with high sides on the countertop. 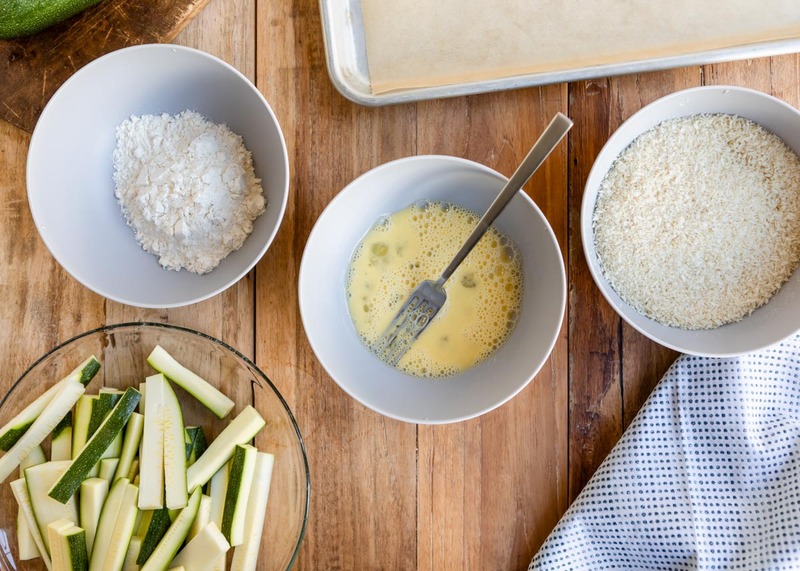 Pour the flour into the first bowl, whisk together the egg and milk in the second bowl, and mix the panko, sesame seeds, garlic powder, and salt in the third bowl. Dredge the fries in the flour, then lightly coat them in the egg mixture, shaking off any excess. Coat with the panko mixture and place on the parchment-lined baking sheet. Once all the fries are coated, spray liberally with oil - this makes them crispy! Bake the fries for 10 minutes, then flip them over, spray again, and cook for 10-15 minutes more, or until the fries are crisp and just beginning to brown. While the fries are baking, make the sauce by stirring together all of the ingredients in a small bowl. 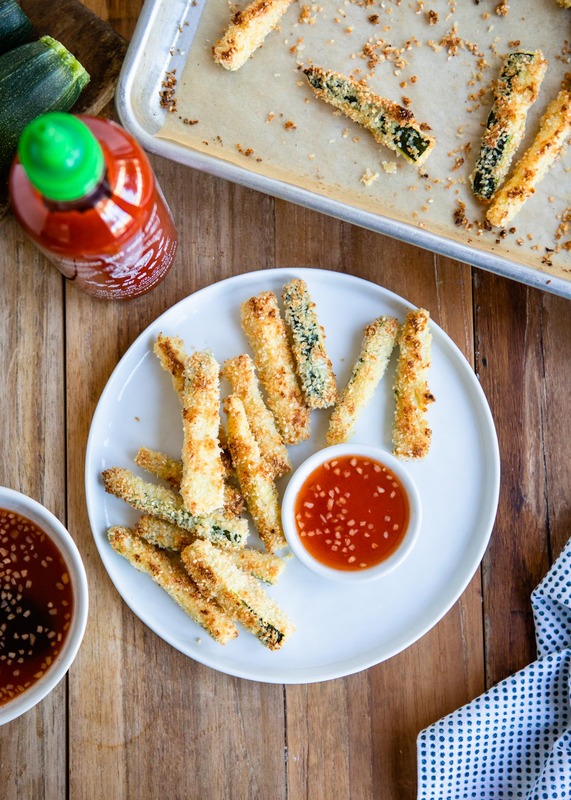 Once the fries are done, serve them immediately alongside the dipping sauce.